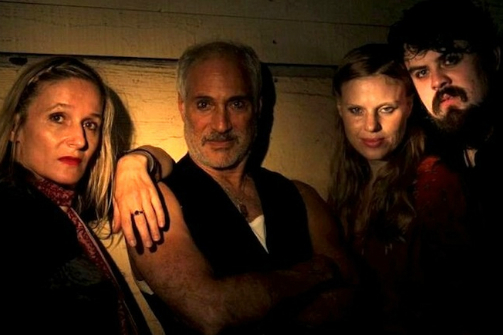 Yvonne Brecht, Matt Mitler, Megan Bones and Jesse Hathaway in Makbet. Photo by Sancar Ayalp. BOTTOM LINE: A strange and exciting telling of an old story that gets a little lost in translation. At the Sure We Can redemption center in Bushwick, a tiny world is being crafted—a world so tiny, in fact, that you could fit it into a metal shipping container with a few dozen audience members and still feel like you’re watching a story that spans many miles. If you arrive in time for the pre-show, you’ll be greeted by the “Gypsies” of Dzieci Theater Company, gathering around a trashcan fire and playing eastern European folk music, entrenched by small mountains of recyclable goods on all sides. They’ll teach you a song or two and pass around a bottle of vodka to help bring your mind into their world, before eventually inviting you into the red, metal box where the rest of the show takes place. The conceit of Makbet is to tell a version of Shakespeare’s Macbeth, with a few rules to constrain the actors in what is otherwise an entirely improvisational performance every night: All the actors have memorized the entire text, they can and will switch roles with each other periodically, and three members of the troupe will play every character in a given performance. What ensues is a lively, thrilling experience that feels as much like a children’s game as a carefully considered ritual. I didn’t have to be sitting within ten feet of the actors to tell how much joy they derived from taking part in this production, even those who didn’t actually get to perform in roles on this specific night. With the entire cast in attendance, regardless of which three take on the characters of the play, the ensemble works together to create a rich soundscape through music, vocals, and percussion, utilizing a variety of instruments, props, and lamps to shape the world around the performers. Dzieci has done a thorough job of creating rules for their games that the audience can pick up on and learn from, informing every moment of the play with the design aspects at work around them. The only sources of light in the space are one hanging light in the center and a plethora of electric lamps which the actors carry and manipulate to light one another. The specific, targeted choices of where to shine light and what to leave in the dark paints an interesting visual at all times, especially in relation to the themes of deceit and vulnerability implicit in the text they are working with. All of the design choices are strong and impactful, so much so that they often, unfortunately, overpower the story and the text itself. The rabid enthusiasm that Dzieci has applied to the frame of the piece and the different storytelling elements (including their thick Russian accents) goes a long way towards illustrating the world and immersing their audience in it, but it was difficult, at times, to discern what was actually happening because of how exciting and distracting the design choices were. Lines of text are drowned out by echoing, percussive banging on the walls; actions important to the plot are missed because of the level of ritual that is applied to the transitions around them. Ultimately, Makbet is a fun experience, and a provocative sample of experimental storytelling, but not an effective depiction of the classic tale of the Scottish king. I would recommend it to people who are interested more in how the story is told than the details of the story itself.